Embarking on a new project, no matter how big or small, is always an exciting, yet scary, prospect with many factors needing to be taken into consideration and lots of important decisions to make (such as which one of our beautiful floors should they choose!). When customers speak to me over the phone or in the showroom about their exciting new projects, I instantly begin to create an image in my head of what it’s going to look like. However, what’s even better is when an imagination comes to life thanks to our lovely customers sending in their images to us! Over the past few weeks, we have been lucky enough to receive quite a few photos of projects that are now complete so I thought now would be the perfect time to share them with you all. 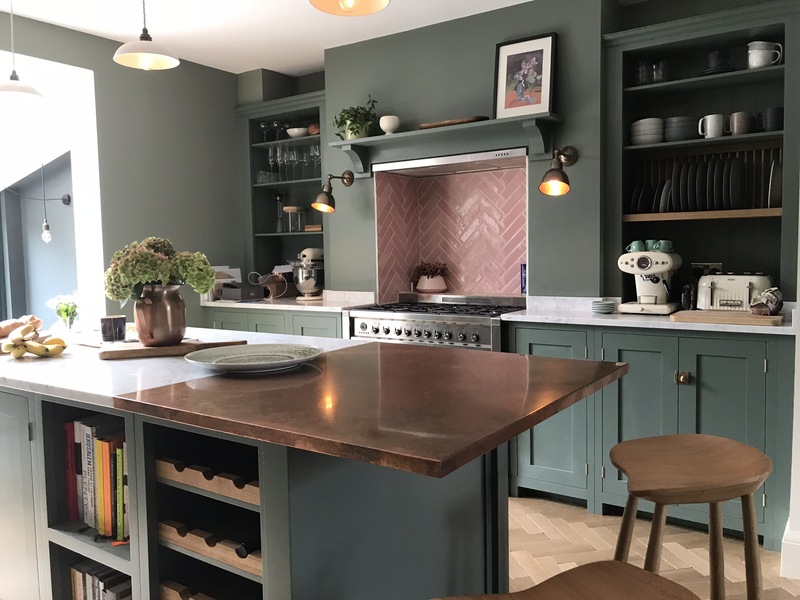 The first one I wanted to show you is this gorgeous green deVOL Shaker Kitchen complimented by our pretty Blush Pink Handmade Tiles which this customer has chosen to use as a splashback for their brand-new kitchen. 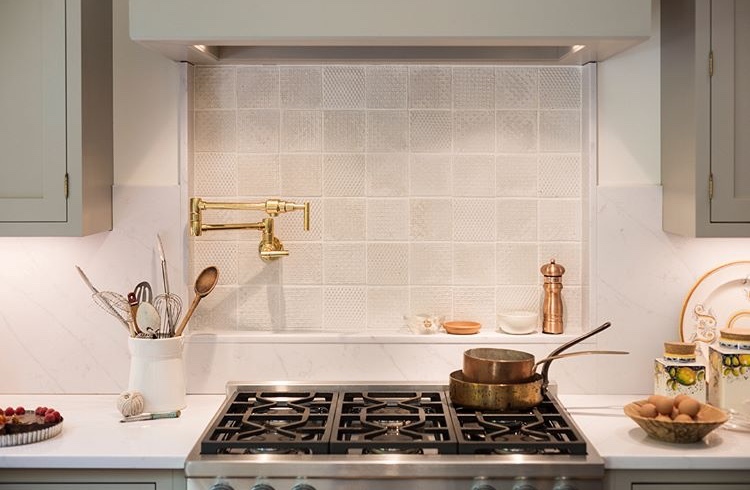 It is very clear to see, by looking at the finer details, that so much time and effort has gone into the designing of this kitchen and we instantly fell in love! The next project I’m excited to share with you is this very cosy kitchen laid with our Umbrian Limestone throughout. 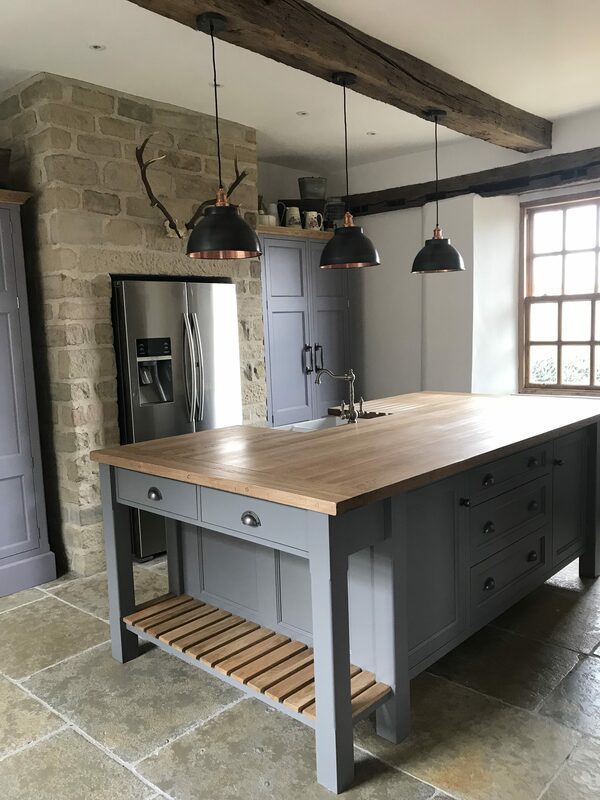 The combination of the exposed brick with the rustic edges of this Limestone really helps to provide a very traditional and authentic look and by choosing our 560xFL (free-length) size it adds further character, making it the perfect homely kitchen. Our Umbrian Limestone is available in other sizes so if you were looking for a more uniform size, we also stock singular sized tiles as well as other free-length options. We were also lucky enough to receive images of one of our customers’ projects all the way over in America! 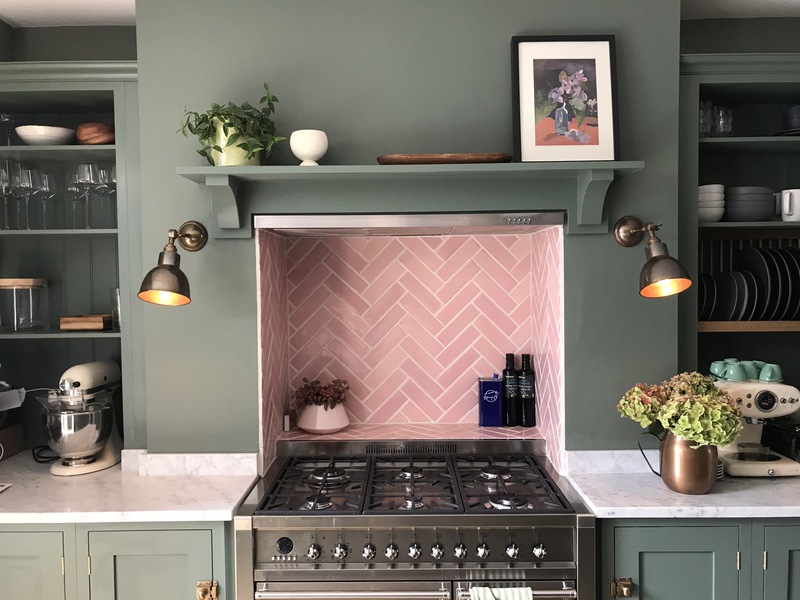 They chose a mix of our beautiful Dove House and Whitechapel handmade tiles in the 120×120 size, again to be used as a splashback, in their very stylish kitchen, which made us all very jealous! 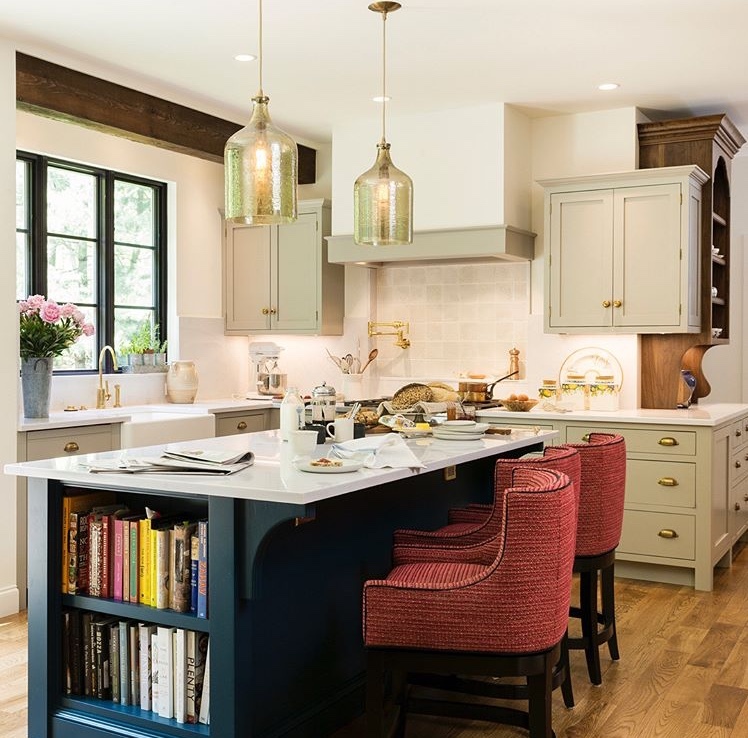 Thank you so much to Nancy Hansen Interior Design for sharing these stunning images with us. 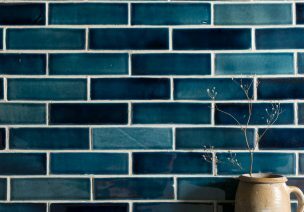 Our handmade tiles are all made on site here in our ceramics studio by our very talented ceramicist, Hannah, so we feel very privileged to have such a skilful talent within our team. 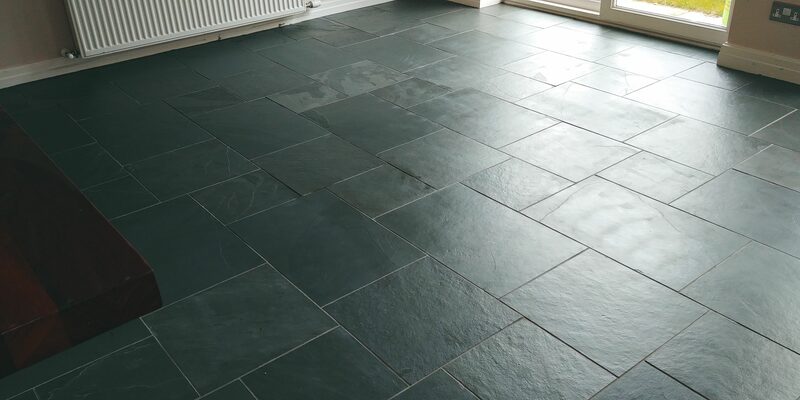 Finally, I wanted to share a project that was completed just a few days ago of our Brazilian Green Slate that a customer of ours has laid in their kitchen. They opted to lay this stone in the opus pattern which gives a much more randomised look with the mix of smaller and larger rectangles and squares. 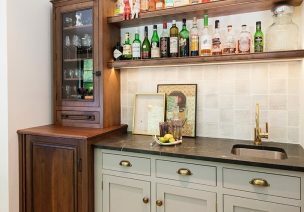 This slate has a calibrated finish making them much more practical for use in busy home environments. I really hope you have enjoyed seeing and reading all about these beautiful projects! 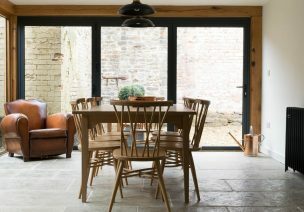 We would love to see many, many more so if you have any images of your Floors of Stone floor, please send them into enquiries@floorsofstone.com as we would love to see them! If you have any questions about any of our flooring, please do not hesitate to contact our friendly sales team on 01509 234000.